AVAILABLE ONLY from UK Sellers. 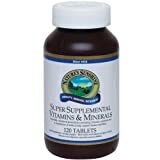 Super Supplemental contains a wide range of vitamins and minerals that can help to make up any shortfall in your daily diet with compete balanced nutrition that offers 100% of the recommended daily requirements of most vitamins and a full complement of minerals essential for good health. Vitamin A for the immune system, B vitamins for energy metabolism, and a reduction in tiredness and fatigue, vitamin C for the immune and nervous systems, and vitamin E for the protection of cells from oxidative stress. Formula also combines a wide range of minerals such as calcium, magnesium, manganese, phosphorus, iron and zinc, which contribute to a wide spectrum of essential processes in the body. It supplies the body with micronutrients from super-foods and contains important carotenoid antioxidants lutein and lycopene that support tissues throughout the body. Take one tablet with a meal twice daily. GENERAL NUTRITION. This product contains vitamin A in the form of retinol. Do not take if you are pregnant or likely to become pregnant except on the advice of a doctor or antenatal clinic. This product contains iron. Ingredients: Di-calcium phosphate, magnesium oxide, vitamin C, calcium bis-glycinate, potassium citrate, zinc gluconate, pantothenic acid, vitamin E (d-alpha tocopherol), l-selenomethionine, ferrous fumarate, niacinamide, choline bitartrate, inositol, pyridoxine hydrochloride, calcium citrate, magnesium bis-glycinate dihydrate, biotin, thiamin, beta-carotene, para amino benzoic acid, riboflavin, vitamin A palmitate, copper gluconate, manganese citrate, alfalfa aerial parts (Medicago sativa), asparagus stems (Asparagus officinalis), broccoli flowers (Brassica oleracea var. italica), cabbage leaves (Brassica oleracea var. capitata), hesperidin bioflavonoid extract, lemon bioflavonoid extract (Citrus limon), rutin, cyanocobalamin, rosehips fruit extract (Rosa canina), horsetail stems & strobilus (Equisetum arvense), vitamin D3 (cholecalciferol), potassium iodide, chromium chloride, folic acid, kelp leaves & stems (Ascophyllum nodosum, Laminaria digitata). Bulking agent; microcrystalline cellulose, anti-caking agent; stearic acid, bulking agent; carboxymethyl cellulose sodium, anti-caking agents; magnesium stearate, silicon dioxide. This entry was posted in Buy Supplements and tagged Minerals, Super, Supplemental, vitamins by TOSMS. Bookmark the permalink.